My final reading response of the semester! This time, we’re finishing off Virilio’s Open Sky with a summary of Part 3! The reason for the silly picture above is Virilio’s more serious prediction that “we are about to lose our statuses as eyewitnesses of tangible reality once and for all, to the benefit for technical substitutes… which will make us of the ‘visually challenged. 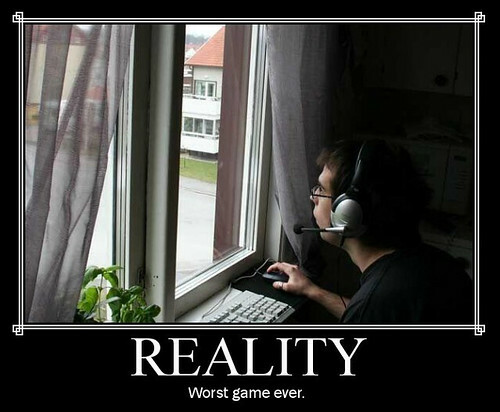 '” This picture is making fun of the fact that a growing number of people spend a lot of their time playing online games, interacting with other people in virtual worlds and not in the real world. The idea that all of our interactions could take place through a screen someday is not too far off. Virilio already talks about how what we see is obscured by the TV screen and by the windows of the vehicles that get us from place to place, and warns of the dangers of indirect light as opposed to direct optics discussed in the earlier parts. It would seem to me as though we’re trying so hard to recreate reality that we’re disregarding the reality that we already have. Instead of experiencing the world ourselves, we’re sitting inside darkened rooms and staring at the screen, living in virtual worlds and neglecting all that’s outside. Google Street View is an example of the real world becoming a virtual world. You can go almost anywhere in the United States, on almost any major public road and see pictures of what’s outside without actually going there. Virilio also talks about how some of these images are so lifelike that we get confused and have trouble distinguishing CG images from real life. Think of Apple’s Retina Display technology and the 326 PPI (pixels per inch) that it’s capable of displaying. Virilio talks about lasers beaming the images directly into your optic nerves, but massive PPI displays are in commercial use today, and they’re so detailed that you can’t even tell that there are pixels. With 4K resolution and the increasing power of GPUs to generate images, as well as the power of real image manipulation tools such as Photoshop and After Effects, we’re getting to the point where things can look absolutely lifelike but unless you see them for yourself you’ll never really know if they’re real or not.